Leverage SBI’s high-quality lentivector technology to study subcellular localization and dynamics with our line of Cyto-Tracer vectors. Easily create stable reporter cell lines with our validated, pre-built lentivectors—available as transfectable plasmids or ready-to-transduce, pre-packaged virus. 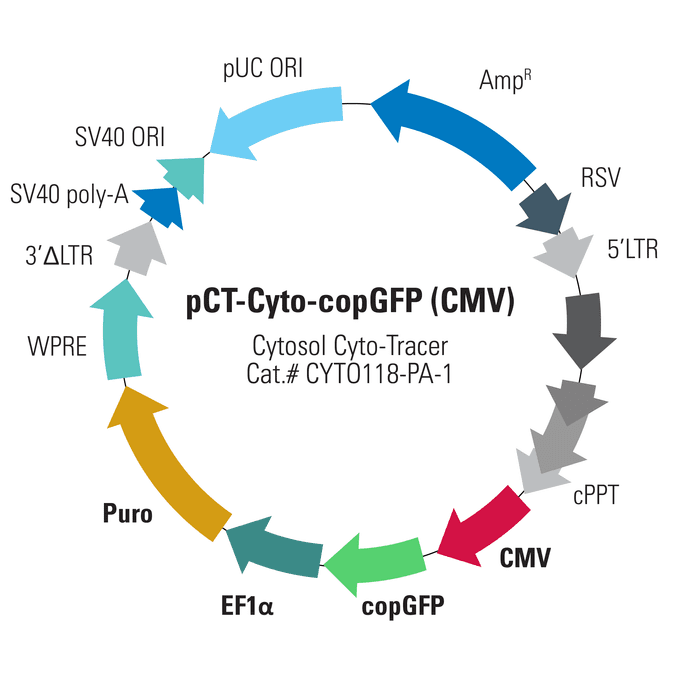 The Cytosol Cyto-Tracer, pCT-Cyto-GFP (CMV), expresses an untagged copGFP, which naturally localizes to the cytosol. copGFP is expressed from the CMV promoter for strong expression in common cell types such as HeLa, HEK293, and HT1080.